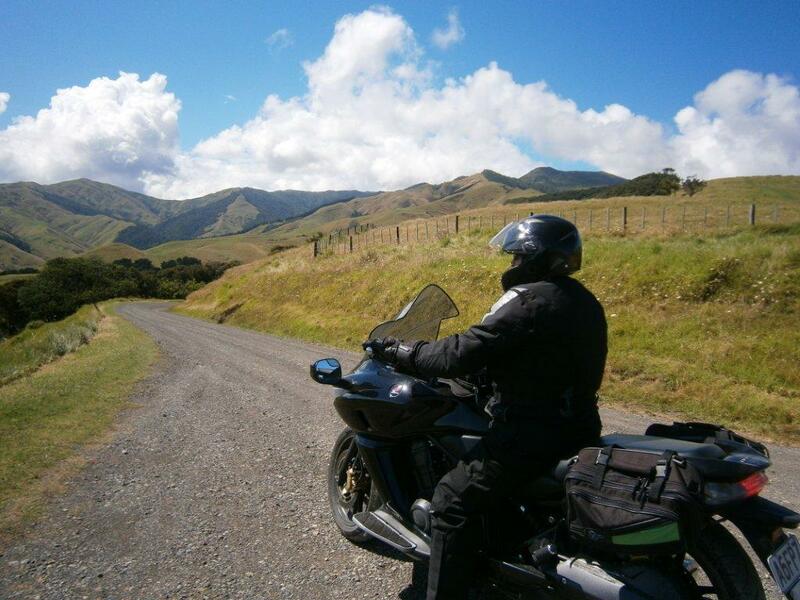 I always look forward to the Paeroa trip it’s one of my bigger rides that I do and is seriously enjoyable. Heading off on Friday morning I catch up with Steve Parker on the mighty DN-01 and we head for Feilding to Steve Hurst’s place were Steve, Malcolm and Brian Ralph are waiting (a small crew this year, most years the club number 12 to 20 on this trip). We headed off up through Vinegar Hill and then State Highway 1 to Taupo for a stop for lunch on the waterfront. From Taupo we went north to Putararu then following one off Ralphy’s infamous short cuts we went east over to the base of the Kaimai's and followed them all the way to Te Aroha, on the way we went past a waterfall coming out of the ranges that was truly spectacular (I am still amazed at this country of ours, after a lifetime of riding driving and working all over the place, there are still so many places I have never seen), from Te Aroha we went through to Paeroa were Brian left us as he was staying with friends, on to Thames and then on to Tapu where the usual accommodation at the motor camp awaited us (and a couple of cold beers and a feed at the pub across the road). 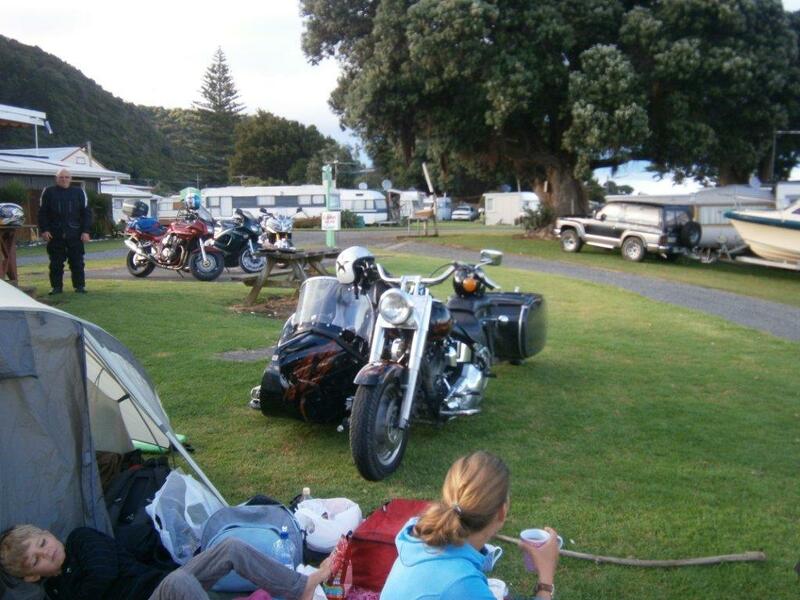 Camped up next to us was a family from Germany who had been riding around New Zealand since new year’s on their Harley with a vintage sidecar and vintage trailer attached, the sidecar had a kiddys car seat mounted into it, so their young son could enjoy the holiday with them. Being German, the sidecar was right mounted so their son was situated on the centre line closest to the oncoming vehicles and they were have a fantastic time touring the country. 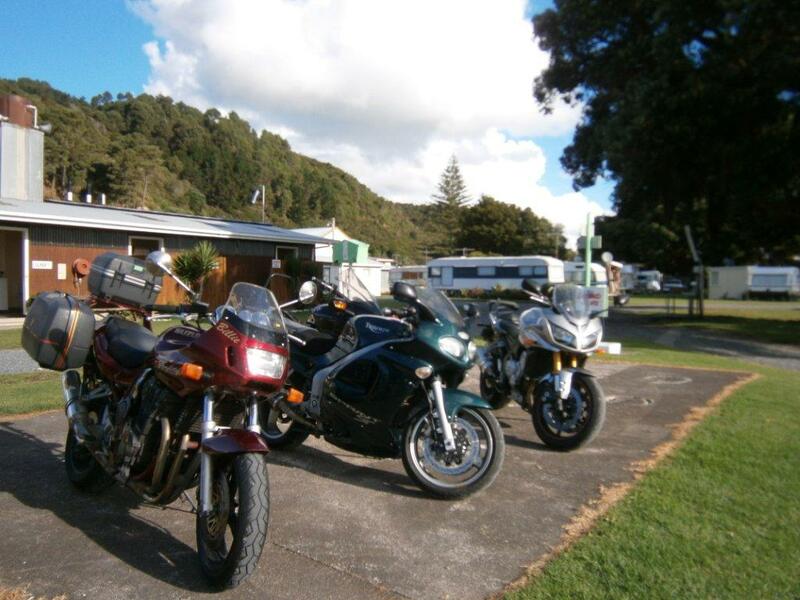 On Saturday morning we headed for Coromandel for breakfast, this is some of the best riding in the country, winding flowing roads with very little traffic. Over coffee and eggs Malcolm suggests the road to Port Jackson is very good but has a bit of gravel at the end (at least that’s what I thought he said, I think he actually said something like, the road to Port Jackson is in too halves the first is an absolutely fantastic flowing tarmac road then the second half is slightly more dangerous than a disused goat track with a number of quite deep forwards) so off we head to Port Jackson, now somehow I had a picture in my head of a nice little town, great place to stop for coffee but turns out Port Jackson is a place on the map only in name, there is nothing there, so without even knowing it I went past and kept going to the road finished at Fletcher Bay (at least I can tick this part off my map). After a bit the too Steve’s turned up but no Malcolm so after a short rest we head back to find that he had stopped half way and decided to wait for us to return after he tipped his bike over in the thick gravel (luckily no damage apart from a couple of small scratches). We carried on back to Coromandel for lunch (yes a 120 k’s took us from after breakfast to lunch time to cover) then we headed south to Whitianga, after Tairua I headed off over the Kopu-Tairua road to visit some people and others carried on to Whangamata, Waihi, Karangahake, Paeroa and back up to Tapu. During the days ride Malcolm had his video camera mounted to his helmet and has posted a clip of the ride on YouTube http://www.youtube.com/watch?v=3txDTjTssIw named “a ride in the coromandel” (please note the video only shows us when we are being good boys). Sunday always rolls around to fast so it was off to Thames for breakfast then on to the racing which was good but they seem to have more and more classic, vintage and other old crapper classes appearing and less real modern race bikes (I guess this is a sign of the times as racing has become so expensive), near the end of the day we catch up with Brian and say good bye to Malcolm who is heading in a another direction. From Paeroa we head to Tirau were over coffee we are joined by Eddie and Richard who are on their way home from a concert in Jaffaland then on another of Brian’s short cuts that brings us out on the road to Mangakino followed by the western access road to Turangi, Dessert road and home for tea. A great weekend with a great bunch from the club and I’ve already booked for next year.